The use of integrative approaches to wellness has grown in the U.S. in recent years. It emphasizes a holistic method that includes mental, emotional, physical and spiritual aspects of an individual, treating the whole person rather than one specific area of concern. Many people turn to alternative therapies for pain relief when traditional treatments fail or as a complement to conventional medicine. 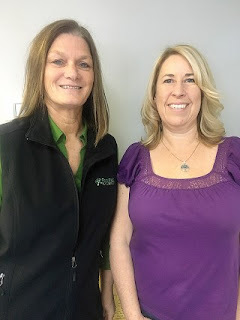 Offering alternative and integrative healthcare as a way toward a complete healthy lifestyle is one of the main purposes’ local holistic practitioners, Lisa DeFosse of Lisa DeFosse Massage Therapy and Karen Tibbetts of Foot Path Reflexology, work together. Besides massage, DeFosse is a Reiki Master who is in the process of becoming a Bowenwork Practitioner and Tibbetts is a Reflexologist as well as a Health Coach. They both discovered their line of work by first experiencing the positive effects their particular modalities had on their own lives. They share their stories as well as the reasons they offer their services to the greater Lakes Region community at their office, 57 Tandberg Trail in Windham. DeFosse graduated from Spa Tech Institute in 2005 and gained her Reiki Master Certification in 2007. She is currently studying Bowenwork in Arundel through Ainslee Farrington, an instructor for the American Bowen Academy and plans to be certified by spring 2019. Massage therapy is manual manipulation of soft body tissues and Reiki is a Japanese technique where the therapist can channel energy into the patient by means of touch. Bowenwork is also a system of touch. DeFosse explained that Bowenwork is comprised of gentle moves applied to specific points on the body with significant pauses or rests between the moves. The work takes the body out of fight/flight mode and puts it into rest/repair/relax mode. “It's like rebooting your computer but instead, you are rebooting your connections in your body,” DeFosse said. Much like DeFosse, Tibbetts discovered her method of therapeutic healing by accident. She had been experiencing multiple sinus infections of which traditional medicine was not healing. “I was being treated with antibiotics and nose sprays for quite some time and the infection wasn’t going away. A friend recommended that I try reflexology. After an eight-week session, which I combined with homeopathic medicine, my sinus infection went away. That was three years ago, and I haven’t had an infection since.” It was at the suggestion of her reflexologist that Tibbetts decided to enter the field herself, becoming a certified reflexologist in 2015 by Myra Achorn of “Treat your Feet School” in Augusta. To learn more about the above services or to make an appointment, contact DeFosse at 207-329-8826 or on her webpage at www.lisaDeFosse.massagetherapy.com and contact Tibbetts at 207-890-1633 or on her Facebook page, Foot Path Reflexology. Tibbetts also offers her services in Oxford.